There were several birthdays that seemed so important when I was young. Sixteen, Eighteen, and Twenty One were all recognized as significant milestones for various reasons, but I'm thinking this birthday is the best milestone of all. so that I can get my much anticipated life-time geezer pass to the National Parks and lands. Free entrance to National Parks and discounted camping in many locations including BLM, Forest Service, etc. Just in time to save some camping fees at Lees Ferry and a slightly reduced rate for the river permit. One week until we launch! After church on Sunday we removed all the stitches. Most came out easy but a few needed a little heat to loosen epoxy around them. With the stitches out of the way, a light sanding was in order. Meanwhile, Willie went to work cutting out the deck form pieces. After filleting all the gaps where the stitches had been, Kathy and I glassed all of the seams. The strips of glass are cut on the bias. In order to get a consistent width, Kathy used a 2x4 as a template for the cutting wheel. Wish I'd thought of that idea years ago! View from the stern with all the seams, including the rear bulkhead, glassed in place. We'd like to go further, but needed to let the glass cure overnight before the next steps. First thing Saturday morning we stacked the matching pieces together and sanded the edges to fair out any unusual high points or uneven trimming of the fiberglass. With that out of the way, Kathy started drilling the holes for the stitches. Using 18 gauge copper wire sold as beading wire, we loosely stitched the two bottom pieces together. The stitched seam will become the keel line of the boat when we open the book. The plans assume one permanent bulkhead (second from the right) and three temporary bulkheads used to set the shape of the boat. In our case, we've decided to install a permanent forward bulkhead which we'll create from the piece that is third from the right. We installed the two sides of the hull using the same loose stitches and then flipped the assembly over so we could make sure we kept the boat straight as we tightened up all the stitches. Finally - right side up and sitting in cradles on the strong back. Just in time - the sheet of material we'd been working on is next to be sacrificed. With the hull right side up, a fillet of epoxy thickened with wood flour is added between the stitches. it's time to start laying out all of the deck forms. There are eleven forms to be marked out, cut out, and shaped to their final fit. Trying to cram as much into a long weekend, we started with a Friday evening session. Kathy was able to get a pair of the hull pieces marked out on the scarfed plywood before I came back to help. After splitting the plywood into two long pieces, we stacked them back to back and I cut out pairs of matching pieces while Kathy started marking out the coaming base. The part on the right is the lower portions of the hull. The hourglass piece is scrap. With the hull pieces cut out, the insides of the four hull pieces were glassed with 4 oz. fiberglass and epoxy. 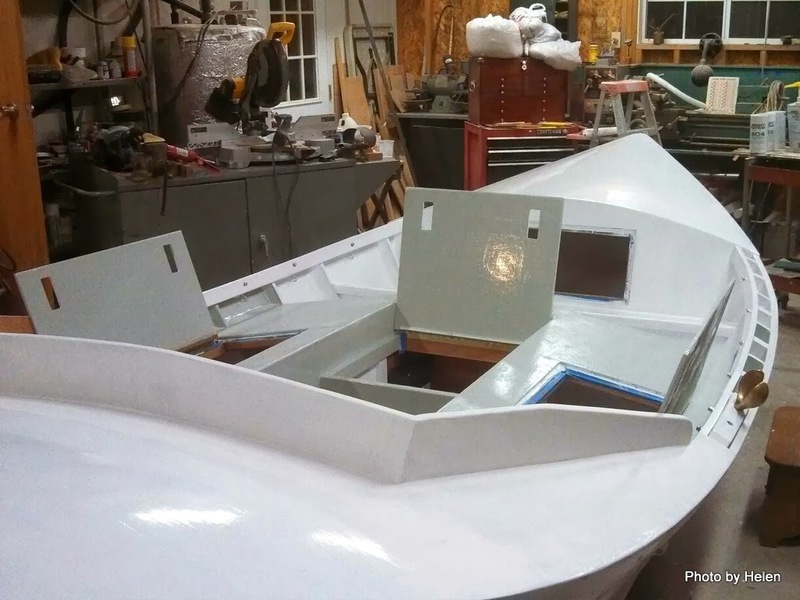 In addition, the second side of the bulkheads and the coaming base were glassed in preparation for a long day on Saturday. Greg Hatton built a replica of the Portola for a 2012 50th anniversary replica trip through the Grand Canyon. He and his boat will be on the upcoming March trip through the Grand Canyon along with Helen's replica of the Susie Too and a replica of the Flavell II that is still under construction. The Portola and the Susie Too are sister boats, sharing the same hull form but with different bulkheads. Greg just shared a link to a great YouTube video that includes pictures from 1962 of the original Portola, Susie Too, and Flavell II boats as well as some great footage of the Portola and a different version of the Susie Too from the 2012 trip. Grand Canyoneers I962-2012 - It's well worth watching! Meanwhile, the pile of gear in the bedroom keeps growing and the length of my list keeps shrinking so I guess we're headed the right direction. Nineteen days until we launch! 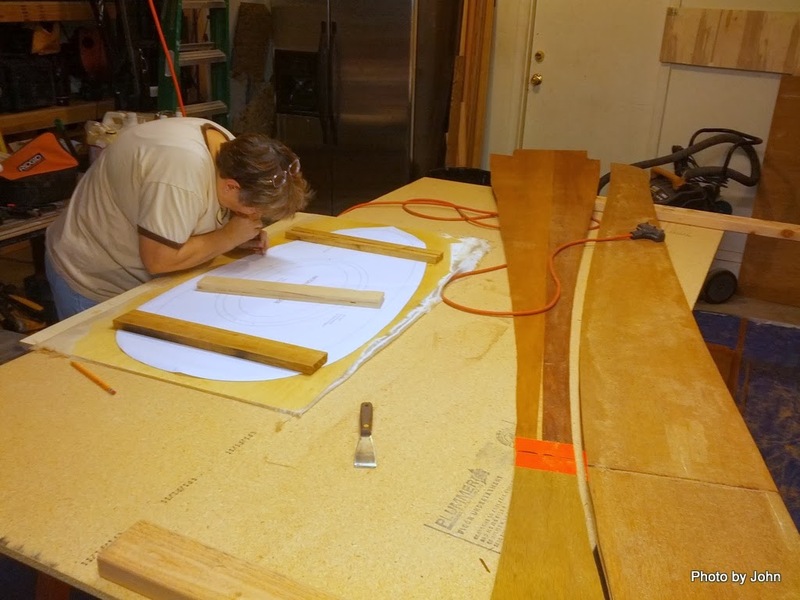 I got together with Kathy to scarf the two pieces of plywood together so she could start laying out the pieces for the hull. The idea is to cut the ends of the plywood on a consistent 8:1 slope. The scarfing can be done with a variety of tools, but I chose to remain consistently lazy. It took a few minutes to make a jig for the router so that we could use the router for cutting the scarf slope. It has a piece that butts up against the edge of the chipboard and a piece of the same plywood as we're scarfing that serves as a spacer. The plans call out for thicker waterproof plywood that is only glassed on one side. We're using door skins, and will glass it on both sides by the time the hull is completed. Our grey tape suffered a color shift, but works great to minimize squeeze-out on the face of the plywood. I had some MAS 2:1 epoxy in stock that a friend gave me so we'll use it up before switching to my favorite - Raka 2:1 thin non-blushing epoxy. Kathy is mixing up 3 tablespoons worth to wet out the edges that we're gluing. Once she did that we mixed wood flour into the remaining epoxy and applied the thickened epoxy to one side of the joint. We flipped one piece of the plywood over so the slopes intersected, carefully lined it up, and clamped the sheets so they couldn't move. Then we put a piece of freezer paper over the joint and stacked weight directly on the joint while it cured. 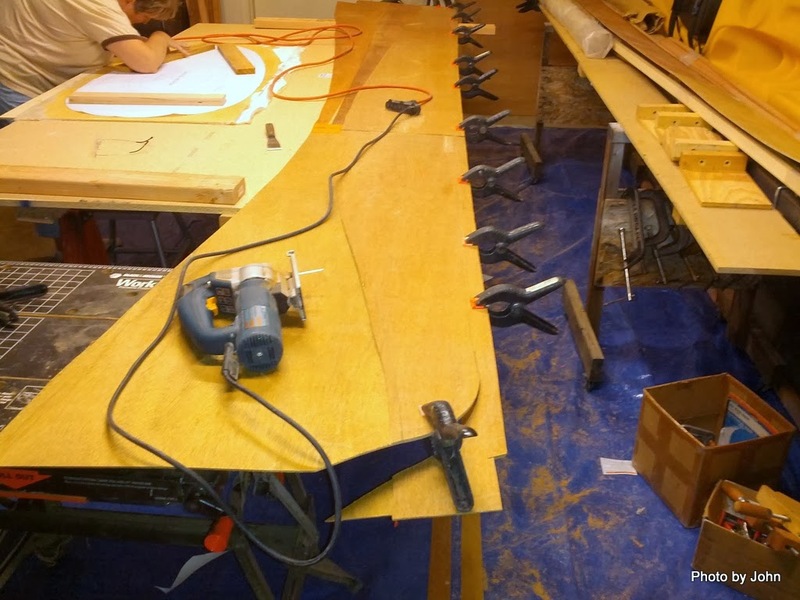 Once we got the main pieces scarfed, we laid out the two bulkheads (the plans only call for a rear bulkhead) and the coaming base on a piece of Baltic birch plywood. Because the light plywood stains easily, we're going to glass both sides before we start assembling the boat. Next steps will be to lay out the hull pieces, glass the inside, and then cut out and assemble the pieces. When I left Helen & Tony at the end of January, I expected to be spending 10 weeks or so building a kayak with Kathy before BJ and I headed to Idaho for a couple months of volunteer work. Most of that plan is intact, but the 10 weeks just shrunk to 6 weeks for Kathy's project. Due to some unfortunate circumstances, a couple spots opened up on Helen's Grand Canyon trip and I jumped at the chance to accompany Helen, Tony, and 13 others on a 25 day trip from Lees Ferry below Glen Canyon dam to Pearce Ferry on Lake Mead. It's 275 miles of world famous beauty and a phenomenal opportunity to watch the dory first hand. I may even get to do some rowing if I can figure out the difference between oars and paddles. The next three weeks will be crazy busy as I try to make as much progress as possible on Kathy's kayak and start building my gear list for the trip. This is what Helen's dory looked like a couple days ago - stolen from her Facebook feed. If all went well, they expected to be putting the Beryl Green trim on her today. Edit: And this is what it looks like at the end of the day on Monday, February 10th with the masking tape yet to be removed. Thursday evening at 5 p.m. I counted 50 eggs. By Saturday morning at 7:30 there were 81 eggs and a few more have wandered in during the day. This picture was taken Friday morning from the upper mine site on Dome Rock. The Quartzsite Gathering is known for the laid back atmosphere. It was almost surprising to see a schedule, even if it was on a white board! Each event seemed to draw a good group of people. Unlike earlier in the week, we started to see some diversity of manufacturers and some of the 13 foot trailers. The Outback and the Boler both came from British Columbia. and a Compact Junior. There were several of the single axle Escapes as well as at least three Escape 19s. A Burro arrived, making it at least six brands that were represented by a single trailer. Several Scamp 13s showed up including Dave & Paula's rig that was sporting a For Sale sign later in the day. It's a very nice, basic rig with a birch interior and a wide dinette / bed. We even had a brand new Trillium join us. Turns out there is a dealer in the Phoenix area representing them. In town there was a display of Oliver trailers - a used 17 and a pair of new 22 foot units. They certainly represented the Oliver's reputation for fit and finish very well! We showed up at the Dome Rock boondocking area in Quartzsite around noon yesterday for the Gathering that officially starts on Friday. Looks like we were about the 28th to arrive -- some have been here for several days already. Lynne saved us a great spot with a beautiful view, even if we could see Phil & Catherine from our back window. If we could see the other direction, we'd see Glenda and Jeff's rig. Sorta blogger's row around here! We were entertained by a tandem paramotor flying around as we approached sunset. Some of the colors were reflected off of the mountains to the east. This morning, we decided to walk as far up Dome Rock as Turk would let us. I was hoping to get to the upper mine site but stopped after visiting the lower mine site. Maybe we'll go back tomorrow without the dog. Part way up the hill we found the source of the paramotor. A couple from Maine haul the rig in their toy hauler and fly where ever the scenery entices them. From the lower mine site we had a view back towards the gathering and Quartzsite in the distance. The trailers have scattered out more this year with fiberglass trailers spanning from one edge of the picture to the other. There are a few other stick-built trailers in the midst and a pair of fiberglass pickup campers. The early mix of brands is interesting. Obviously lots of Casitas and a notable number of BigFoot (BigFeet??) trailers. There are 3 Scamp 19s here - all the deluxe version, but only one other Scamp so far. There are several Escapes here already. So far there are no 13 footers of any brand, and none of the older brands like Burro or U-Haul. It will be interesting to see what shows up in the next couple days. I used to do a fair amount of woodworking, but the Scamp took over what had been the space for my woodshop. 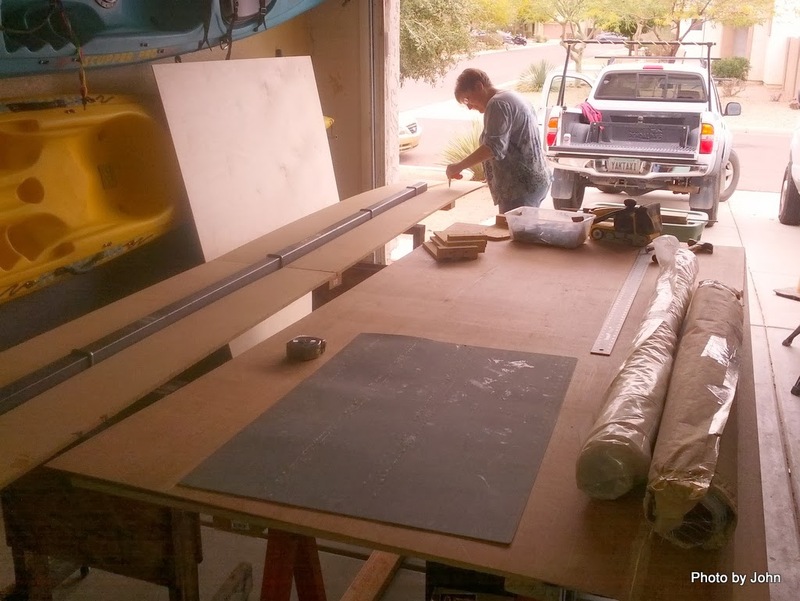 I kicked the Scamp out this morning since we needed to prep it for our trip to Quartzsite tomorrow, and used the space for a few hours to rip strips for the deck on Kathy's kayak. The work was out of sequence but it saved me moving the trailer later. I've had some extra clear Western Red Cedar and some other wood for strips in stock for a number of years. This project was a good excuse to use up some of the inventory. I started by ripping 1/4" strips off the side of nominal 2x6 - one was 12' long and the other was a 6' piece. The next step was to lay the strips down and split them into 2 pieces. The end result was a bunch of 1/4" x 3/4" strips, a big pile of sawdust, and a dusty garage. I was careful to keep the pieces from the 12' board in order so that the grain matches. I did that with a smaller '9 piece and would have done it with the 6' piece but that one had lots of internal stresses so the individual strips tended to be a bit weird - they just ended up in a bundle. I also cut some Alaska Yellow Cedar, the last of my Port Orford Cedar, and some Black Walnut for trim. 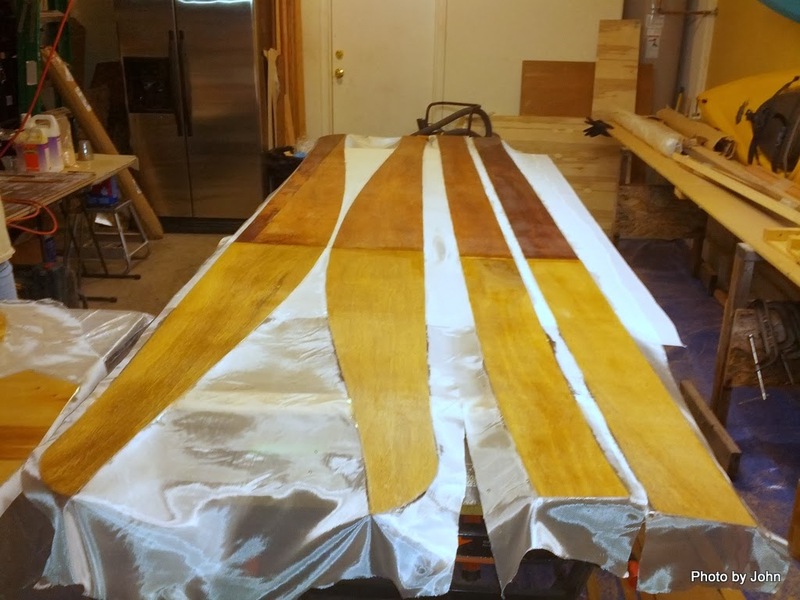 When we get back from Quartzsite we'll start on the kayak and see what we can do about eventually using these strips in some sort of artful combination. 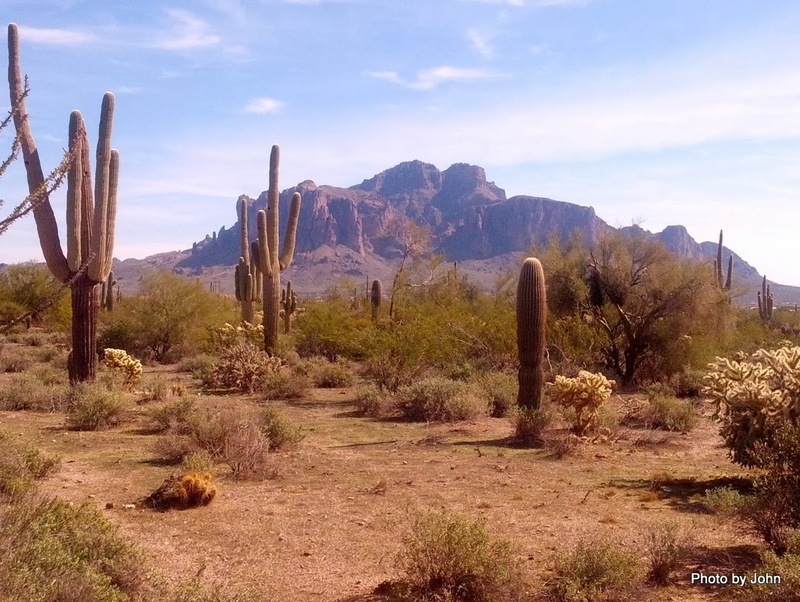 BJ and I were wandering around the other day on the north side of Apache Junction. She had noted some new houses going in midway between our house and the Superstitions, so we drove out to see what was happening. That led to wandering through a desert neighborhood that we'd never visited before. Some beautiful views and lots of saguaros. 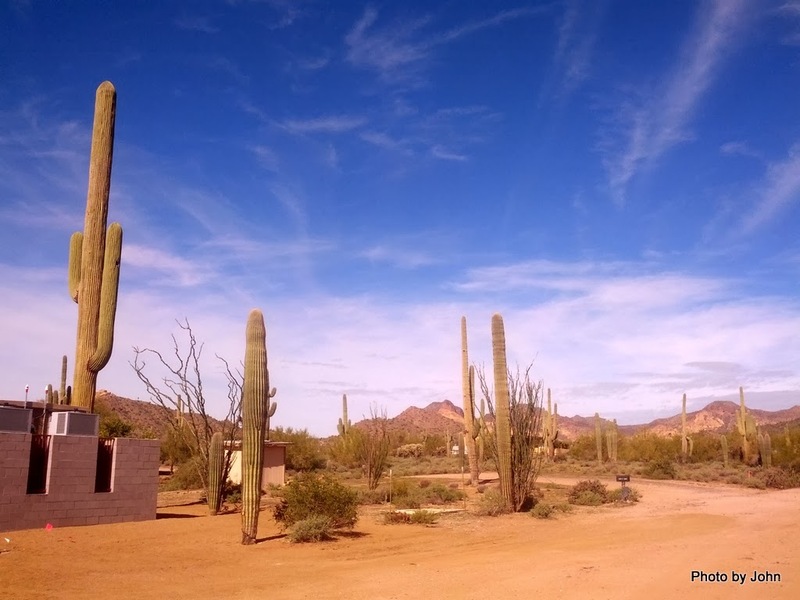 We spotted one very stately saguaro, and then realized it was actually a cellphone tower. (The one on the left.) It appears that this is a new installation that hasn't gone into operation yet. Now that I'm done with my part on Helen's dory, I'm ready to start the next project. This time it will be a boat for Kathy, my typical bow partner on Green River or lower Colorado River trips. It's the Wood Duck 12 design from Chesapeake Light Craft. We hauled a bunch of stuff from my garage to hers today and got the strongback and work table set up. We'll actually start on it after BJ and I get back from the Quartzsite Gathering. The boat will be a "stitch and glue" hull with a cedar strip deck. As usual, we'll follow the plan closely, but the instructions loosely.